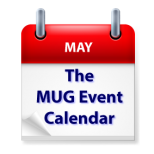 This week’s MUG Event Calendar features too many Apple Watch discussion o list; suffice it to say that, featured topic or not, it will be discussed at user group meetings everywhere. Featured speakers this week include Jeff Gamet of The Mac Observer’s Daily Observations Podcast and Apple Context Machine, who will cover, what else, Apple Watch at a Colorado group. And Dan Frakes of The Wirecutter will speak remotely to an Alaskan group. Some other topics on this week’s agenda include Keynote, Photos, computer hacking and security, backup strategies and a family picnic.